This image of the central parts of Centaurus A reveals the parallelogram-shaped remains of a smaller galaxy that was gulped down about 200 to 700 million years ago. The image is based on data collected with the SOFI instrument on ESO’s New Technology Telescope at La Silla. New images show the "last meal" of a giant cannibal galaxyas it gobbles down a smaller spiral galaxy, which has been twisted and warpedfrom being devoured. The giant galaxy, Centaurus A (NGC 5128) is the nearestgiant, elliptical galaxy, at a distance of about 11 million light-years. Thegalaxy hosts a supermassive black hole that is 200 million times the mass ofthe sun, or 50 times the mass of the black hole at the centerof the Milky Way. At the galaxy's center is an opaque dust lane that isthought to be the remains of a cosmicmerger between the galaxy and a smaller spiral galaxy full of dust. Between 200 and 700 million years ago, this galaxy isbelieved to have consumed a smaller spiral, gas-rich galaxy ? the contents ofwhich appear to be churning inside Centaurus A's core, likely triggering newgenerations of stars. First glimpses of the "leftovers" of this meal were obtainedthanks to observations with the European Space Agency's Infrared SpaceObservatory, which revealed a 16,500 light-year-wide structure, very similar tothat of a small barred galaxy. More recently, NASA?s Spitzer Space Telescope resolved thisstructure intoa parallelogram, which can be explained as the remnant of a gas-rich spiralgalaxy falling into an elliptical galaxy and becoming twisted and warped in theprocess. Galaxy merging is the most common mechanism to explain the formationof such giant elliptical galaxies. 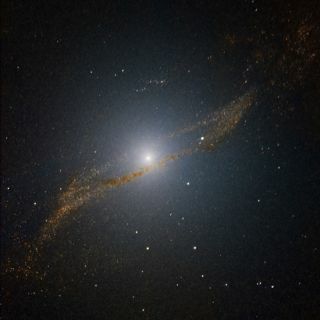 The new images, taken by the European Southern Observatory's3.58-metre New Technology Telescope (NTT) in La Silla, Chile, allow astronomers to get an even sharper view of the structure of this galaxy, completelyfree of obscuring dust. What the astronomers found in the images was surprising:"There is a clear ring of stars and clusters hidden behind the dust lanes, andour images provide an unprecedentedly detailed view toward it," said JouniKainulainen, lead author of the paper reporting these results. "Further analysisof this structure will provide important clues on how the merging processoccurred and what has been the role of star formation during it." The technique used to observe Centaurus A could helpscientists better understand star formation in galaxies. "These are the first steps in the development of a newtechnique that has the potential to trace giant clouds of gas in other galaxiesat high resolution and in a cost-effective way," said co-author Jo?o Alves. "Knowing how these giant clouds form and evolve is to understand how stars formin galaxies."